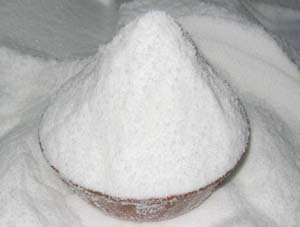 Xylitol is a white crystalline sugar substitute. It looks like sugar and tastes like sugar. It is present in fibers of many fruits and vegetables such as corn husks, oats, and mushrooms etc. It can be extracted from corn fiber, birch, and corn etc. It is a popular sweetener for the diabetic diet, because it can be absorbed more slowly than sugar, and does not contribute to high blood sugar levels or the resulting hyperglycemia caused by insufficient insulin responseonly. In addition, Xylitol is a "tooth-friendly," and non-fermentable sugar. Scientific studies demonstrated dramatic reduction in new tooth decay, and even some reversal of existing dental caries. Xylitol only possesses about 40% less food energy such that it is a low-calorie alternative to table sugar. In the market there are two common types of Xylitol, one is from corn, and one is from Birch tree. Ours is from Birch Tree.